Welcome to our Ischia blog, Good Morning Ischia! Here you can see the entry for Sunday 8th December 2013. I'm happy to report that it's another fabulous start to the day in Ischia, the sun is up and is set to stick around for the rest of the day. Outside, the island is painted in a heady mixture of bright autumnal colours being beautifully showcased by the early morning sunshine. The outlook for the next few days remains very healthy, even if there may be a few light showers around here and there. Today's temperature predictions are for a maximum of 15° celcius (60° fahrenheit) and a minimum of 13°C (56°F) with a very light breeze to keep us company. Today's photo comes directly from the Ischia Review garden and shows one of those lovely lemon trees that I mention from time to time. A few weeks ago the fruit on this tree was of a decidedly green hue but the lemons are gradually ripening every day and they're now more or less ready to use. 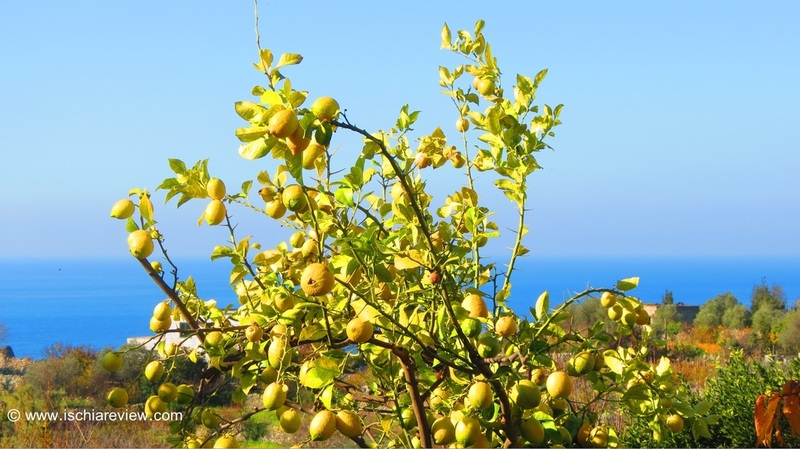 Given the fact that we are blessed with such a bountiful supply it should come as no surprise to learn that the lemons are widely used in Ischian cuisine and somewhere along the line you will enjoy their taste, even on the shortest visit. Perhaps the most notable use for the lemons is in the delicious alcoholic liqueur known as Limoncello which is made mainly from their peel. Most Ischian homes have their own stash and a lot of the time that's because it was made at home but walking along any of the main shopping areas in Ischia such as Corso Vittoria Colonna in Ischia Porto or Forio town centre you will see a variety of shops stacked with a whole host of Limoncello bottles with dozens of different brands and labels to choose from. You'll also have the luxury of trying a little bit before buying, most of the vendors confident in the knowledge that once you've tasted a sip you'll be desperate for a larger quantity. Lemons are used in many other ways in Ischia including as part of a dressing for salad and obviously as the perfect complement for most fish dishes which are a mainstay of Ischian cuisine. For those people lucky enough to have their own supply then they can also be used to help carry-out domestic chores like washing-up or even mopping the floors, such is their versatility. Some events I should tell you about are happening in Ischia Porto today, the ice-rink that I mentioned yesterday will be opening this evening with a display of ice dancing before it is opened to the public and I'll fill you in on all of the details on how to participate in tomorrow's blog. There will also be the opening of the annual "enchanted forest", a display of Christmas lights that is mainly for the children but draws people of all ages. We'll be there later on this evening so that we can take some photos and explain what it's all about. Ok that's all from me today, have a great Sunday and I'll be back with more tomorrow morning.